The Broken Kingdoms is the second book in The Inheritance trilogy by N. K. Jemisin, following closely behind the February release of The Hundred Thousand Kingdoms, the first novel. The third book, The Kingdom of Gods, will be available in 2011 and is told from the point of view of Sieh, the trickster god. The majority of The Broken Kingdoms takes place ten years after the end of The Hundred Thousand Kingdoms. While this book has a different main character than the previous novel and could work as a stand alone, I’d recommend starting at the beginning. Since Oree, the main character, does not have a lot of inside knowledge about the events ten years ago, she does not understand all of what is happening for a while, but those who have read the first novel will be one step ahead of her. Although it might be fun to discover what is happening right along with the narrator, knowledge of the background will help to get the most from the story. Plus it is fun to see familiar characters from the first book make appearances. One month after the appearance of the World Tree in Sky, Oree left her home to go live there. For ten years she makes a meager living selling her artwork in the streets. One morning when she goes to throw out her paint, she happens to see a rather unusual sight – she sees “glory awaken in a pile of muck” when a glowing man arises from a heap of garbage. This extraordinary personage, whom Oree nicknames “Shiny,” never speaks to her until Oree finds a dead godling in an alley. This seems to have raised his ire, leading to trouble with a priest of Itempas. Oree gets help to bail him out of trouble, and in the process, she meets a couple of other gods who seem rather unhappy with Shiny. It leaves her wondering just who he is and why no one will tell her anything about him, but it seems they have bigger problems – they learn that there are 30 days to find the murderer of this godling or one of the three gods not known for restraint is going to deal with it. Like The Hundred Thousand Kingdoms, I loved The Broken Kingdoms, which I actually thought was a little better than the first book. It was very absorbing – after reading just a few pages, it became difficult to put down. The world, the characters and the writing all just work so well for me, and call me sadistic, but I also liked that the ending was bittersweet with more bitter than sweet. Not everything worked out perfectly, but it also made sense as the reasoning behind the conclusion was fitting for the characters involved. At first I saw only delicate lines of gold limn the shape of a man. Dewdrops of glimmering silver beaded along his flesh and then ran down it in rivulets, illuminating the texture of skin in smooth relief. I saw some of those rivulets move impossibly upward, igniting the filaments of his hair, the stern-carved lines of his face. And as I stood there, my hands damp with paint and my door standing open behind me, forgotten, I saw this glowing man draw a deep breath — which made him shimmer even more beautifully — and open eyes whose color I would never be able to fully describe, even if I someday learn the words. The best I can do is compare it to things I do know: the heavy thickness of red gold, the smell of brass on a hot day, desire and pride. As much as I liked Oree, I did find there was one instance where it seemed to take her longer to put two and two together than I would have expected. She had all the information, but did not seem to realize what that implied until it was pointed out to her. Also, there were a few times I felt her descriptions were a little too descriptive for a blind person, but these were also a bit tricky since she could see at times so I tried not to wonder about it too much. The Broken Kingdoms also showed the aftermath of the end of The Hundred Thousand Kingdoms and how the world has changed as a result. As a commoner, Oree also had a very different viewpoint from Yeine since she mostly saw the outskirts of the palace. Her life consisted of selling her artwork in the streets with others who were barely scraping by. It was still far from ordinary since she had magical abilities and was romantically involved with one of the godlings, but she didn’t have much knowledge about the royal family or many of the things Yeine knew about. On the topic of Yeine, she, Sieh and Nahadoth do all appear in this novel. I was particularly happy to see Sieh, so childlike but also cold and not someone you want to tick off. The gods range from inhuman to almost human-seeming, and a lot of the more major ones tend toward being temperamental and prone to over-reaction. Yet they still do have definite motives for being upset. 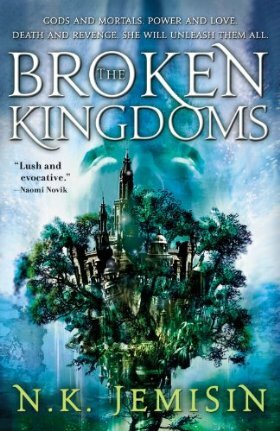 The Broken Kingdoms had everything I loved about the first book in this trilogy – an absorbing story, an intriguing setting and world mythology, and a likable narrator with a compelling voice. The next book cannot come out soon enough.